DIY projects are supposed to be fun, but when you're working on them with your significant other, they can turn downright ugly! We all know that whether you're building a new coffee table or tiling a bathroom, a breakdown in communication can make turn a weekend task into a month-long nightmare, which is why we've rounded up some of our favorite do-it-yourself projects that are so simple, you and your better half will be able to complete them without ending up in couples counseling. Click through our gallery to see them all! If you’ve ever coveted one of those designer, distressed-wood coffee tables, here’s your chance to make your own and save a whole lot of loot while you’re at it. This DIY was done by our very own Bridgette Meinhold for only $5, which is probably less than the cost of the large soy lattes you and your partner can chug while you’re building it. Made of old shipping pallets, it even has a storage area to keep your various remotes and magazines. And did we mention it only cost $5?! 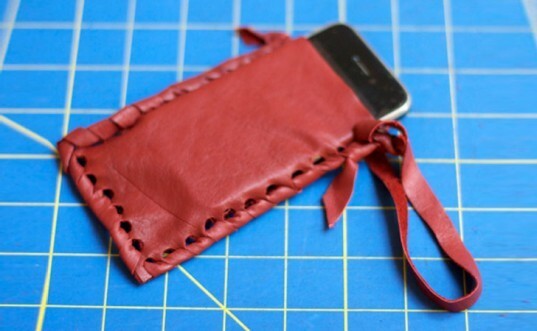 If DIY solar bags seem a little too complicated for you, how about starting small with matching recycled iPhone cases? This easy DIY was dreamt up by reMade USA’s Shannon South, and is a nice, relaxing way to spend a weekend afternoon and use up any leather scraps you have – perhaps that beat-up leather jacket that you’ve been hounding him to get rid of? If you and your better half are oenophiles, this little project from crafter extraordinaire Danny Seo is the perfect way for you to use up all of the corks you’ve amassed. If you haven’t saved your corks, you can always start now or even hit up your local bar or restaurant. Then all you need is a shadow box or frame and you’ll have a super-absorbent, designer DIY cork mat that you made with your own four hands. Have you heard of “pair look” – the trend where couples and families wear matching clothes to signify their closeness? Well, if you like the idea of matching with your partner but wearing identical outfits is a little too extreme for you, why not make a coordinating pair of solar bags? Not only is it a great way to recycle bags that you already own, but the set of two DIY bags will actually cost you less than just one store-bought sun-charged bag and will make for a cute story too! If you and your partner are both DIY newbies and want to start with something that requires practically no hammering, sewing, or even gluing, check out this eggceptionally easy seat made of egg cartons. Conceived by former ReadyMade editor-in-chief Andrew Wagner, this clever project turns found egg cartons into a chair simply by piling them up high and securing them with a few straps. You and your better half can probably crank one of these babies out in just half an hour or so, so why not make one for each of you to sit on and celebrate afterwards during a romantic meal the same night? This DIY project is a great compromise if your honey happens to be a hoarder. Julie Brzezinski came up with the idea to turn old TVs into useful storage shelves – a way to finally get those old electronics out of the garage and turn them into something that isn’t just a waste of space. Her shelves are easy to make and are the perfect solution if you’re a couple that constantly argues over what stays and what needs to be thrown away. 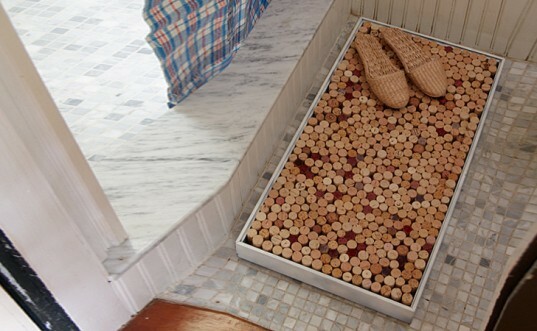 Love the cork mat! We've been having fun collecting/saving wine corks for awhile- totally doing this project with them! You do know that shipping pallets are treated with a number of "wood preservatives". Prior to 2003, these included arsenic and chromium (for US made pallets). Who knows what kinds of preservatives are in there now and where the pallet was originally made? 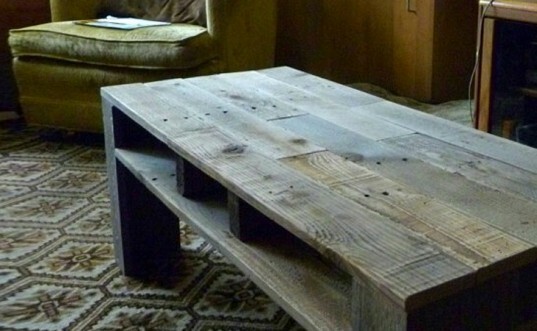 Your nice looking distressed coffee table could be of-gassing some very unhealthy chemicals into your home. TABLE FOR TWO If you've ever coveted one of those designer, distressed-wood coffee tables, here's your chance to make your own and save a whole lot of loot while you're at it. This DIY was done by our very own Bridgette Meinhold for only $5, which is probably less than the cost of the large soy lattes you and your partner can chug while you're building it. Made of old shipping pallets, it even has a storage area to keep your various remotes and magazines. And did we mention it only cost $5?! WEPHONE > IPHONE If DIY solar bags seem a little too complicated for you, how about starting small with matching recycled iPhone cases? This easy DIY was dreamt up by reMade USA's Shannon South, and is a nice, relaxing way to spend a weekend afternoon and use up any leather scraps you have - perhaps that beat-up leather jacket that you've been hounding him to get rid of? PUT A CORK IN IT If you and your better half are oenophiles, this little project from crafter extraordinaire Danny Seo is the perfect way for you to use up all of the corks you've amassed. If you haven't saved your corks, you can always start now or even hit up your local bar or restaurant. Then all you need is a shadow box or frame and you'll have a super-absorbent, designer DIY cork mat that you made with your own four hands. Have you heard of "pair look" - the trend where couples and families wear matching clothes to signify their closeness? Well, if you like the idea of matching with your partner but wearing identical outfits is a little too extreme for you, why not make a coordinating pair of solar bags? 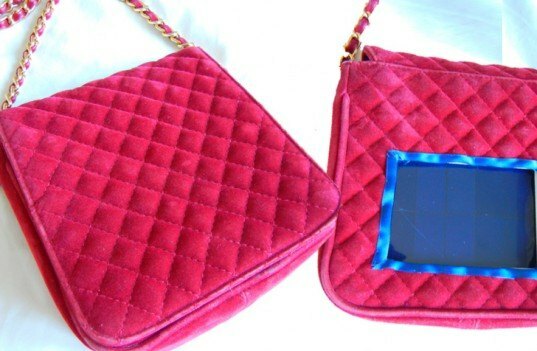 Not only is it a great way to recycle bags that you already own, but the set of two DIY bags will actually cost you less than just one store-bought sun-charged bag and will make for a cute story too! EGGCEPTIONAL SEATING If you and your partner are both DIY newbies and want to start with something that requires practically no hammering, sewing, or even gluing, check out this eggceptionally easy seat made of egg cartons. Conceived by former ReadyMade editor-in-chief Andrew Wagner, this clever project turns found egg cartons into a chair simply by piling them up high and securing them with a few straps. You and your better half can probably crank one of these babies out in just half an hour or so, so why not make one for each of you to sit on and celebrate afterwards during a romantic meal the same night? 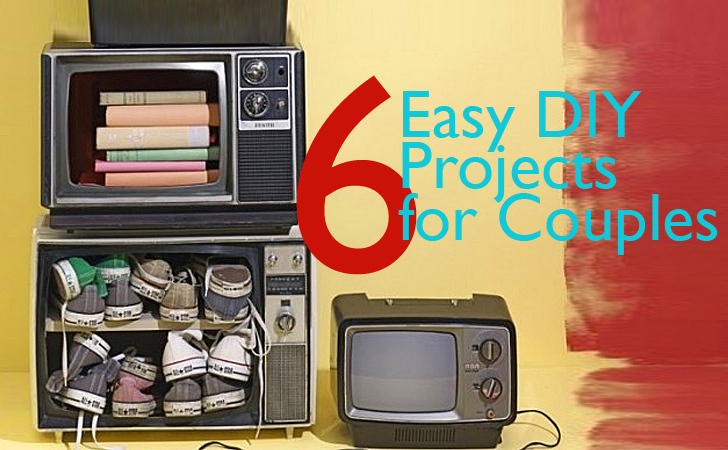 TV TRANSFORMATION This DIY project is a great compromise if your honey happens to be a hoarder. 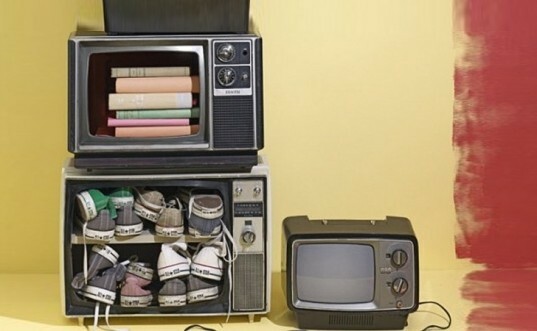 Julie Brzezinski came up with the idea to turn old TVs into useful storage shelves - a way to finally get those old electronics out of the garage and turn them into something that isn't just a waste of space. Her shelves are easy to make and are the perfect solution if you're a couple that constantly argues over what stays and what needs to be thrown away.